The older we get, I find it is harder for someone or something to alter our ingrained beliefs, including those internal truths we guard about our tastes. 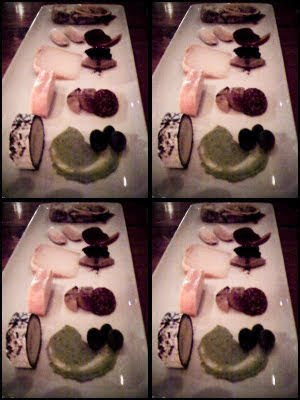 A cheese plate at Casellula last night struck at one of my taste beliefs: that I don't like sweet and savory together. For years, I have positioned that I won't eat game paired with a fruit based sauce; cheese and fig compote don't work for me; I dislike bread with fruit in it; what's with quince paste getting so close to cheese all the time? For some reason, this taste belief of mine, doesn't actually include food and wine pairing. I love blue cheese and Port or Sauternes. No one said there was logic to our taste beliefs. "'This cheese plate is a JOKE. Totally disgusting. All this STUFF, ugh, it's gross.' - woman who plays the medical examiner on CSI to me." I am not going to go into the detail of the cheeses on my plate (I didn't bring my note book). 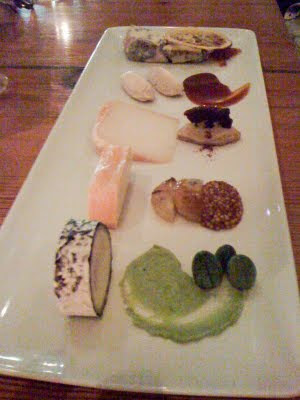 I loved the cheeses, but it wasn't the actual cheeses that blew my mind, it was the cheese and condiment pairings. 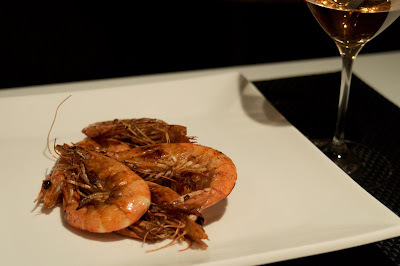 The plates look artfully presented which always provides a good first impression. Tia works hard to create unique, interesting, and let's be honest, challenging condiment pairings. There were tiny little melons from the farmer's market which provided a fantastic tart, bright, refreshing bite. The cipollini onions and whole grain mustard had a sweet and savory contrast. Chocolate and cheese? I am a chocolate crazed person, so I definitely had strong opinions against this one. Wrong again, it worked well. There was a deliciously, strange, unique cheese from Sicily (if I remember correctly) paired with a caramel type sauce. Lastly there was a Belgian blue cheese and a bitter orange marmalade, garnished with a dried slice of orange. This last one really got my attention. I couldn't help myself, even though I was sharing the plate, I kept on going back for more, and more, and more. It was a fantastic combination. So while I consider myself very flexible when it comes to trying new food things, I still have an ingrained set of food beliefs that deep down, I think, are unchallengeable. It is really fun to find something that impacts just one of those beliefs. I still don't think I am ready to eat game with a fruit sauce, but I guess our taste beliefs may just have to be challenged one by one. 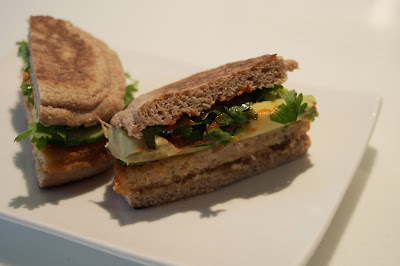 One of my favorite, easy, and healthy lunches is to make a quick sandwich with a whole wheat English Muffin, a pan fried (defrosted) tofu chicken patty, sliced hot house cucumber, sliced avocado, cilantro, and sriracha. This little sandwich sometimes gives me everything I want: crisp, cool, heat, flavor. My preferred tofu chicken patty brand is the Morningstar Farms Chik Patties Original - they seem to be a little "meatier" and have a sweeter flavor than the Original Chik'n Patties. Sardines always seem to be my fall back when the fridge is looking a little bare or for that matter, even when it's full. They are a wonderful little snack, and can make for a healthy lunch. Some whole wheat toast, some cucumber slices, sardines, a squeeze of lemon, a sprinkle of sea salt (Maldon's in my case) - it's all you need. 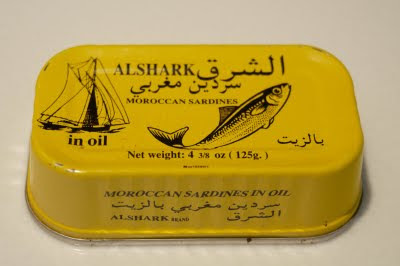 I found Alshark Moroccan sardines at Kalustyan's market. I am always on the hunt for new canned sardines - I'm always looking for options to knock the Matiz sardines off their top spot of my preferences. The Alshark came pretty close. They are meaty, subtle, slightly briny. The Matiz are still on top though and the search continues. Some days, it's just hard to figure out what you want to cook at home. Picking up fish at the Lobster Place in Chelsea Market on Friday afternoon, the thought of tapas at home crossed my mind. 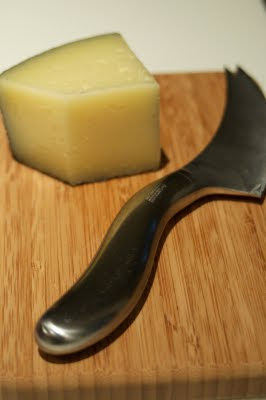 Young Manchego which was just the right cheese to start with since it is milder, fresh, and softer than more aged versions. Coated in olive oil and seasoned with salt, pepper, paprika, red pepper flakes, cayenne pepper, then pan fried in a non-stick saute pan until pink and perfectly cooked. 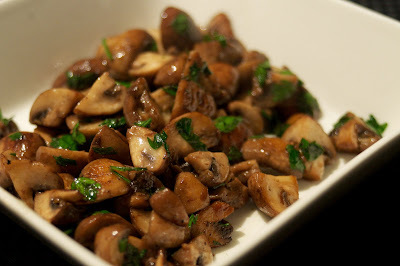 Small Cremini mushrooms, chopped into quarters, sauteed in olive oil, seasoned with salt and pepper, and finished with dry vermouth and chopped flat leaf parsley. At La Nacional, their menu has the translation of patatas bravas as "fierce potatoes" and it always makes me smile, so I included it here too. 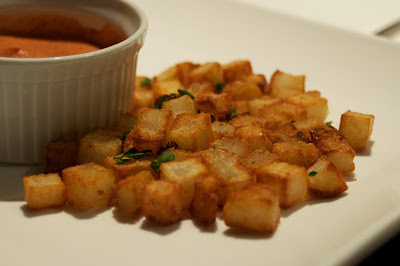 As always, I was hoping to make an authentic version of the spicy sauce which really makes the patatas bravas, but based on what I had bought from Chelsea Market and what I had at home, here's what I cobbled together. In a saute pan, heat a tablespoon of olive oil over medium-high heat, and add 1 crushed garlic clove to the oil. As the garlic starts to turn golden, add a tablespoon of tomato paste and stir everything together. Cook the mixture for a couple of minutes and remove from the heat. I separated the oil and the tomato paste mixture. The oil turned out to be a fantastic tomato, garlic dipping oil for some bread. To the tomato, garlic paste mixture, stir in 3/4 tablespoon paprika, 3 dashes of Tabasco, 1/4 teaspoon Cayenne, 1/8 teaspoon thyme. In a separate bowl, blend together 1/4 cup mayonnaise and 1/4 cup of Ketchup (this is the ingredient that flagged this recipe as in-authentic, but what do I know). Blend the tomato spice mixture into the mayonnaise Ketchup mixture. Check for smokiness (paprika) and spiciness (Tabasco, cayenne). In a medium saucepan, parboil two large Idaho potatoes with their skin on. When the potatoes have cooled, skin them, and chop into 3/4 inch cubes. In a saute pan, heat 2 tablespoons of olive oil over medium-high heat. Season the potatoes with salt and pepper and cook them in batches in the saute pan. Cook until golden brown, drain on paper towel, check for seasoning, and to serve, sprinkle with chopped flat leaf parsley. I used the spicy sauce as a dipping sauce rather than covering the potatoes with it - personal preference. Lopez de Heredia 1998 Viña Tondonia Rosé Gran Reserva. This is truly one of my favorite wine producers and this rosado is both unique and delicious. This is their latest release of rosado! Made from 30% Tempranillo, 60% Garnacho, and 10% Viura. This is an ideal food wine. It has a lovely salmon pink color, sherry tones, minerals, a brininess, smoky, orange peel. The second wine of the evening was another one of my favorites: Do Fereiro 2007 Rias Baixas Rebisaca. This is just a sublime white wine and perfect with grilled or pan fried sardines. It's really briny with essence of limes and an underlying minerality. 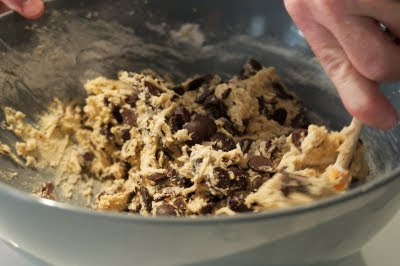 1) The cookie dough is best when it has rested for between 24 and 36 hours. When you think about this, it makes a lot of sense, but the biggest challenge is actually planning ahead. 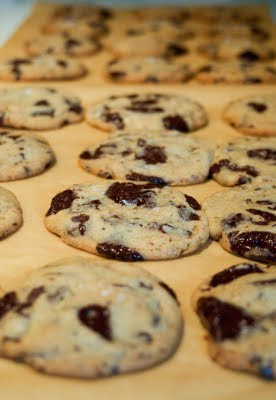 When I think about making cookies from scratch, I want those results instantly, not in 24 to 36 hours. I have tested both the 24 hour and 36 hour versions. It really is worth the wait for 24 hours, the cookies come out with a deeper, richer, better all around flavor. 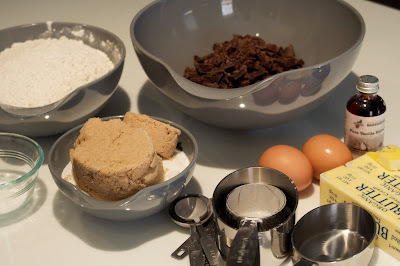 2) Most chocolate related baking recipes call for adding salt at some point in the process. However, adding sea salt to the top of the cookie as well, results in a cookie with a little exclamation point of sea salt and chocolate. Notes: 1) I used All Purpose Flour instead of the bread and cake flours (purely based on what was available and what I had in the pantry). 2) For the chocolate, I used 60% cocoa, but used a combination of disks and chopped chocolate bars. 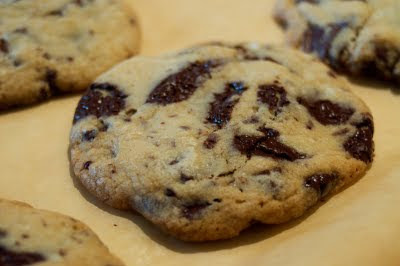 Including chopped chocolate bars add little (and larger) flakes of chocolate to the cookie. Follow the recipe instructions included in the article. There's something about breaded chicken breasts that I just love. It could be the moistness of the chicken, it could be the crispiness of the coating. I just really enjoy the whole package. Instead of following the normal flour, egg, breadcrumb approach, I often use Dijon Mustard as the gluing agent. I also like to bake the breasts rather than fry them, partly because it means I don't have to wipe up the stove of splattered fat. After a few tasty, but not quite perfect previous approaches to baking the chicken breasts, dinner last night came through. I tossed the breadcrumbs and herbs in olive oil in a heated skillet. Everything came together, the tang of the mustard, the flavor of the herbs, the crispness, the juiciness. And as always, there were leftovers. Don't get me started on how good perfectly cooked cold chicken tastes. In a bowl, combine the panko breadcrumbs, oregano, tarragon, salt, and pepper. Add olive oil (enough to cover the bottom of the pan) to a saute pan over medium head and when the oil is hot add the breadcrumb mixture and toss (or stir) in the olive oil. Cook until the breadcrumbs start to go brown. Do not over brown them because the chicken and breadcrumbs will cooking in the oven for about 30 minutes. Pour the breadcrumb mixture into a bowl. Pull off the little chicken tender portion of the chicken breast and season both pieces of chicken. Coat both pieces with Dijon Mustard and toss in the breadcrumbs making sure the chicken pieces are coated with breadcrumbs. Put the chicken in a baking dish lightly coated with olive oil and bake in the oven for about 30 minutes or until the chicken is browned and cooked through. The chicken tender piece will take about 15 to 20 minutes. Francois Cazin 2008 Cheverny Petit Chambord. This is an excellent value from the Loire Valley and of course is brought in by Louis Dressner. It has medium weight, with lemon and lime confit and a bracing acidity. 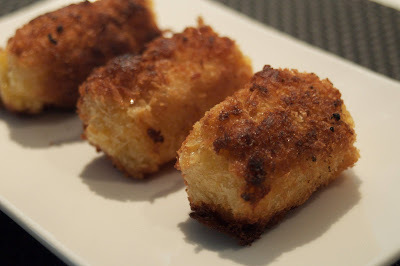 Wonderful with the breaded chicken, the acidity just cuts through the crispy breadcrumbs. By legislation, Cheverny has to be a blend and this is traditionally a blend of Sauvignon Blanc (70%) and Chardonnary (30%). This vintage definitely feels more Sauvignon Blanc to me; in previous vintages the Chardonnay seems to round out the wine in a lovely way. After eating at two Venezualan arapas restaurants and photographing pizza at Pasita recently for the new site, I must have had the La Reina ingredients floating around in my head. After getting hit hard after walking around in the heat on Sunday, comfort food needed to be on the menu and pizza came to mind. Pizza dough from the pizza guy on the corner, chicken, avocado, mushrooms, crema: fresh, clean, vibrant, pizza - just what I needed. 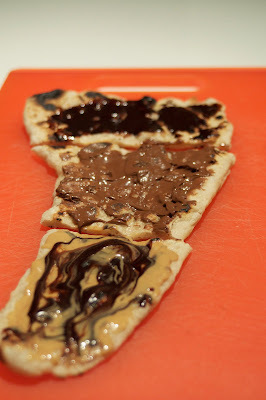 Of course, I made sure there was enough pizza dough left over to make a tasting sample of dessert pizza (peanut butter and chocolate sauce, nutella, chocolate sauce). Incidentally, this is the second time in a week, I have used crema in a dish and both times I used low fat sour cream. I am not a low fat focused person, but for me this crema recipe is really easy and provides good flavor and zing. I need to do a complete taste test with non-fat, low fat, and full fat sour cream. I did the same thing with cream cheese and have ended up using low fat at home all the time. The non-fat just tastes chalky and loses its creaminess, but the low fat works well for me. Heat a grill pan over high heat on the stove. In a saute pan cook the thinly sliced chicken strips and then the sliced mushrooms in olive oil, seasoning with salt and pepper. For the crema, mix together the sour cream, lime zest, and lime juice. Roll out / stretch out the pizza dough with a little flour either with a rolling pin or your hands (I would just stretch the dough using your hands). Brush olive oil on the pasta dough and place on the hot grill pan. When the dough is browned and bubbly on the first side, flip and cook the second side. Slice the ripe avocado and set aside. 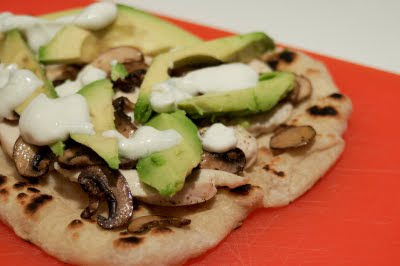 On the cooked pizza crust, add slices of chicken, mushrooms, top with the avocado slices, and finally drizzle with crema. Such a fresh, zesty, creamy pizza. Prep the pizza dough as above except instead of drizzling with olive oil, sprinkle both sides with sugar. The sugar creates a lovely crispy, caramelized crust on the dough. On a hot grill pan, cook both sides of the pizza. When cooked spread peanut butter and chocolate spread on one third, Nutella on anther third, and chocolate spread on the last third. What's Wrong With Me? Winter Dishes in the Summer? It was surprising that after going to the Union Square green market on Saturday morning, I was searching around the freezer as if it was winter, looking for what to cook for Sunday dinner. 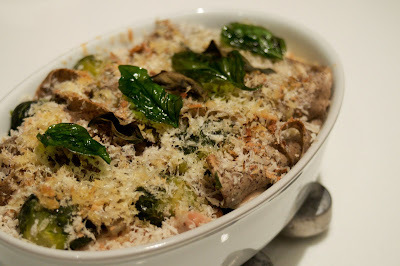 But baked pizzoccheri noodles, chicken, brussels sprouts, onion, bread crumbs, parmesan, basil it was. Albeit, this was a much healthier version of the dish than the one I made in March, but even so, baked pasta dish in the heat of the summer? What's wrong with me? Pre-heat the oven to 375 degrees. Get a large pot of salted water boiling. In a saute pan over medium heat, add olive oil, the chopped garlic and onion, season and cook until translucent. Add the sliced chicken breast, season, and saute until cooked through. Remove from the heat. Add the brussels sproutsto the boiling water and after a couple of minutes, add the pasta and cook until al dente. Drizzle some olive oil around a casserole dish and repeat layers of the pasta, the brussels sprouts, the chicken and onion mixture, and the grated cheese. Lightly season each layer. 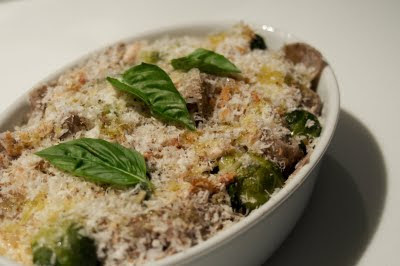 When the layers are complete cover the top in bread crumbs, grated parmigiano, and drizzle with olive oil. Add three leaves of basil to the top. Bake in the oven for about 15 to 20 minutes until brown on top. While the pasta is baking, in a small frying pan add some olive oil and heat until hot. When the oil is hot, fry individual leaves of basil until crispy. Drain on kitchen towel. When the pasta is browned on top, add the whole, crispy basil leaves as garnish and serve. I actually paired this with a Spanish red left over from the previous night: Themera, Enologica 2008 Ribeira Sacra Alodio. A lighter to medium bodied red that I had stored overnight in the refrigerator, so it was definitely chilled, which I really liked. It had red fruits, some cherry, and a touch of minerality. It paired reasonably well with the dish, but I would have preferred an Italian red such as a Nebbiolo, Barbera, or a blend. The Sella Orbello would have done really well, as would the Sandro Fay 2007 Rosso di Valtellina. It was raining outside (or at least threatening to rain), there was red cabbage left over from making fish tacos and some farmer's market potatoes lying around, I felt the urge to make a more hearty dinner. 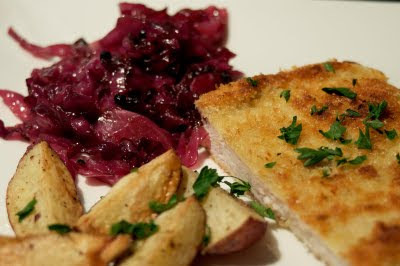 Braised sweet and sour red cabbage (thanks to a slightly modified recipe from Simply Recipes), roasted potatoes, a pounded breaded chicken breast (chicken schnitzel, chicken milanese). In a large pot over medium heat, melt the stick of butter, add the red cabbage, add the peppercorns and season with some salt. Soften the cabbage for about 5 minutes, stirring every couple of minutes. Add the sugar, stirring to coat, then add the vinegars. Cook the cabbage for about 30 minutes until soft and cooked through, stirring every few minutes. I definitely cooked my cabbage through, in fact some of the cabbage pieces were almost crunchy, which I actually really enjoyed. For the potatoes, pre-heat the oven to 425 degrees, and while the cabbage is softening (in the first 5 minutes), wash the potatoes and cut them into quarters lengthwise. In a roasting pan, coat the potatoes with olive oil and season with salt and pepper. Put the roasting pan in the oven until the potatoes are golden and crispy, about 30 minutes. Turn the potatoes a couple of times throughout the cooking process. For the chicken, set up three stations in shallow baking dishes with the flour (seasoned with salt and pepper), the beaten egg, the panko breadcrumbs. Prep the chicken by pounding the chicken breast in a piece of parchment paper (or cling wrap) until evenly about 1/2 inch thick. Salt and pepper the chicken and place it in the flour station. Toss the chicken in the flour until coated and dust off any excess. Coat the chicken in the beaten egg and place in the panko breadcrumbs. Flip the chicken cutlet a few times until fully coated with breadcrumbs. Over medium-high heat, in a non-stick frying pan, add a tablespoon of olive oil. When the oil is hot, add the chicken cutlet and cook until the first side is crispy and brown. Flip over the cutlet and cook the other side until crispy and brown. Remove from the pan and place on a couple of pieces of paper towel. Garnish the potatoes and the chicken with some chopped fresh parsley. This was a perfect warming, comfort dish. The crispy chicken cutlet always makes me happy. This was my first time cooking red cabbage and the flavors worked really well as a foil for the chicken: sweet, sour, almost caramelized. Note: the red cabbage will serve 4 to 6 people, but this leaves enough for leftovers for me. I loved the fish tacos for dinner last night. I liked the flavor so much, I even waited about half an hour before having my required post dinner chocolate fix. There was some tilapia and other fixings left over from dinner and there is nothing I like better than leftovers. Lunch today? 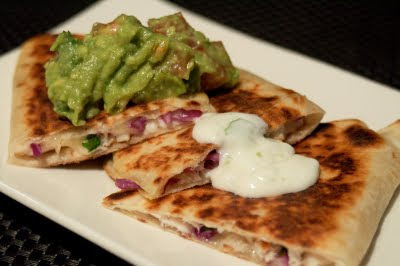 Fish taco quesadillas. Heat a non-stick pan on medium high heat. Evenly flake / break up the tilapia on one side of the flour tortillas and squeeze a little fresh lime juice on top of the fish. Add cilantro leaves evenly over the fish, then a small amount of cabbage since you want to keep the quesadilla reasonably thin. Finally add the grated cheese. Fold the top of the flour tortilla over and give the whole thing a little press. In the heated pan, add a little olive oil, and add the folded quesadilla. When browned on the first side, flip / almost roll over onto the uncooked side. If you are making more than one (and who can resist more than one), keep the cooked quesadillas on a piece of foil in a 300 degree oven. I serve them with the leftover crema from last night's tacos and it was just as amazing with the quesadillas. 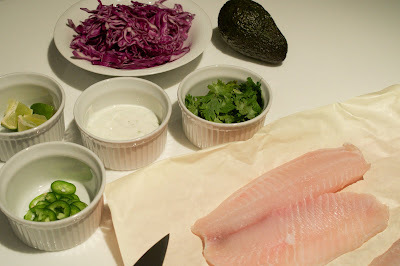 In fact, I really enjoyed the homemade guacamole, but I think it slightly overpowered the fish. The crema alone was a perfect match again. I guess that means I get to have the guacamole later as a snack. None - it was lunch time - I thought about it, but need to be productive this afternoon. The Gros Plant from last night would have matched really well with the crisped, cooked tortillas though. After researching arepas joints for the past two nights (Caracas in the East Village and El Cocotero in Chelsea) for FindEatDrink.com (coming soon) an evening at home with fish tacos and a bottle of wine seemed like a great idea. I was not in the mood for frying, so grilled tilapia was in order, purchased from the Lobster Place in Chelsea Market. I made the crema ahead of time, basically mixing the sour cream, lime juice, lime zest, and buttermilk together. I used homemade buttermilk which was the result of making homemade butter over the weekend. The resulting crema is light, creamy, zesty. The rest of the meal, is just as easy to prepare. Heat the oven to 300 degrees and pre-heat a grill pan on the stove top on medium high heat. Wrap the tortillas in foil, and put the package in the heated oven. 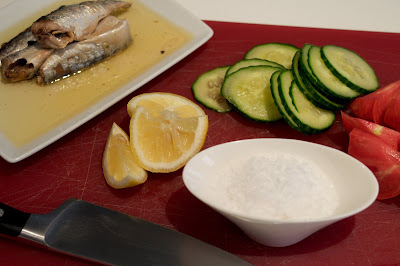 Slice the tilapia fillets into 3/4 inch slices, coat with olive oil, and season with salt and pepper. Grill the slices on the hot grill pan, flipping when the edges of the slices start to turn a murky white color. 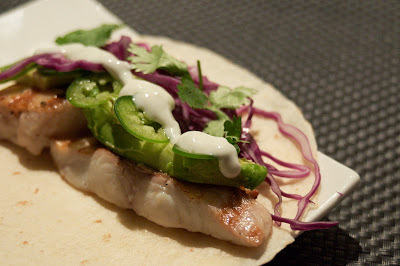 Now you get to make the fish taco however you want. 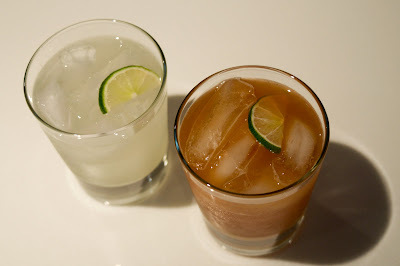 I needed to add salt and lots of lime juice to make me happy, but it's entirely up to the person eating them. I was choosing between beer and wine, but since I had paired beer with arepas the last two nights, I was in the mood for wine. This meant a crisp white with high acidity. I went with a Bregeon 2005 Gros Plant. A great summer wine. Lighter, very crisp, clean, a little minerality, lots of lime, lemon.